The BBQ Squad expansion brings an extra dose of speed and brutality to the battlefield. 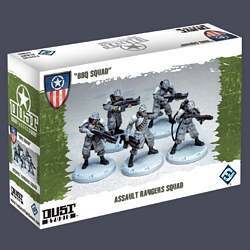 These assault rangers know the definition of hit-and-run tactics, staying light on their feet while packing a punch in combat. The BBQ Squad specializes in close combat against infantry and armored vehicles. Known for their vicious Shotgun blast, these Rangers also carry a Flamethrower to handle heavily-armored targets. But their most deadly threat to the enemy are Demo Charges, small satchels packed with explosives that can take out any threat on the battlefield.